We're really back this time! We are really back this time and my 13 and 8 year olds will be doing our reviews on this site. We want to use this as a way for them to develop writing skills, taste great candy and have fun as a family. We buy lots of candy on our vacations and enjoy limited or special edition anything. Look for more reviews soon, I posted our first one today. First, let’s talk about the look. The packaging is very nice. The design embodies the spirit of its home state, Oregon, with a beaver, a salmon, and St John’s Bridge. The bar looks nice too. There are little stars on the top and it has the Moonstruck man embossed in the middle of the bar. Now, the taste. It isn’t like the traditional American chocolate bar in the sense that it was more milky than sugary, which I prefer. It melts nicely on the tongue and has a good consistency in the mouth. The flavor is straight chocolate, no notes of fruit or flowers at all. The only downside (if I had to find one) is that the cool embossing leaves a large piece unscored. Overall, I would say this is the best chocolate bar I’ve had in awhile, let's hope Moonstruck continues the good work. We found this box of Jelly Belly Bean Boozled Jelly Beans in the very back of our candy stash. I was clearing out my stash to make room for all of the new stuff I need to review from the 2011 Candy and Snack EXPO. Initially I was really excited, liked I'd found a treasure buried deep in the depths of my candy cupboard. The initial excitement did wear off when I realized what I'd found. I completely forgot they had flavors like ear wax, booger, and vomit along with great flavors like peach, plum, and my all time favorite, juicy pear. If this candy sounds familiar to you, then my guess is that you recognize it from the Harry Potter movies and the Jelly Belly Bertie Bott's product they make. You can watch a fantastic review of this candy from the Candy Gurus. 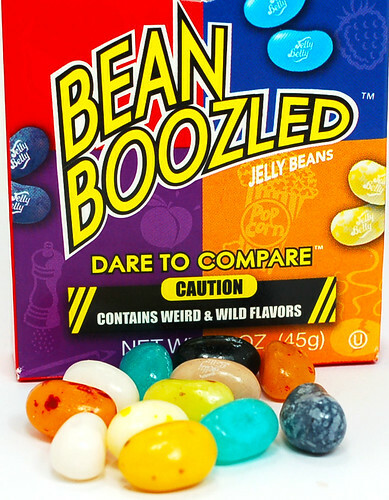 Jelly Belly still sells this Bean Boozled product and it is probably a big hit for them. I'm guessing the Bertie Bott's candy is also a big hit, but it is the exact same thing with fancier packaging and a higher price tag. My seven year old burst into hysterical laughter and had an uncontrollable need to try and eat as many disgusting flavors as possible. I'm guessing he is the target market for this candy. I'm not saying that because I'm a genius marketing guru, I'm saying that based on his overly excited reaction to a candy that tastes like vomit. No really, there's a vomit flavor in there, so I can say that. In the photo above you can see the crazy flavors that come in this box. 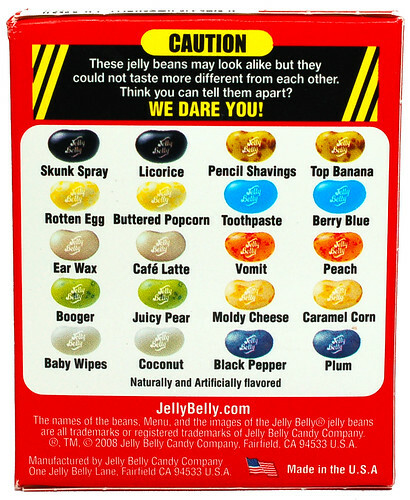 They are all mixed up with the normal Jelly Belly flavors so it's a mystery game as to which flavor you'll actually get. The marketing on this candy is fantastic. I love the "Dare to Compare" and big yellow "CAUTION!" they put on this packaging. Those are like crack to any boy under the age of sixteen. Our family sat down and tried these out and turned this into a pretty fun activity. We had some favorites like toothpaste, black pepper, cafe latte, juicy pear and plum. We had some horrible experiences with vomit, skunk spray and ear wax. They were HORRIBLE, but were spot on for the taste. The baby wipe one confused the heck out of me because it smelled and tasted like the wipes we use on our one year old. Okay, I've never tasted those wipes, but if I had, I'm sure the taste was identical. The rotten egg flavor was probably the worst of all and never in a million years did I think I'd look forward to the buttered popcorn flavor, which looks identical to the rotten egg flavor. Buttered popcorn (which I do NOT like) would have been a relief compared to rotten egg. Try these out, it was fun to sit down and laugh as a family trying out these flavors and watching each other's facial expressions. I can still hear my seven year old get really excited while reading the back of the box and saying "I can't wait to taste booger!". Jelly Belly, you marketing geniuses! I realize this isn't a "new" candy. 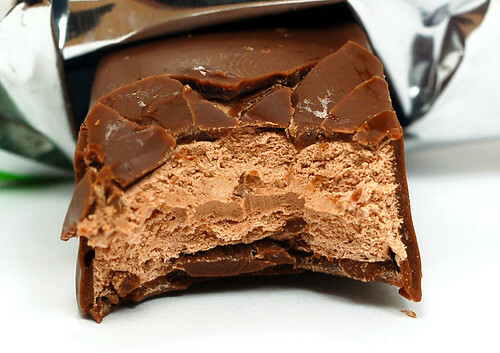 The 3 Musketeers bar has been around since 1932. 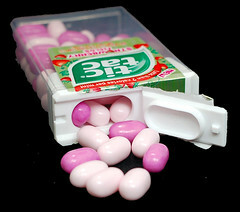 There used be three small bars in each package, a strawberry, a vanilla and a chocolate, hence the "three" in the name. Chocolate was the most popular and was the only one that survived the rising costs and wartime rationing on sugar during WWII. Along the way, Mars has introduced us to mint, french vanilla, mocha cappuccino, strawberry, cherry, raspberry, and orange versions. However, the chocolate version has always remained and is the one most of us are familiar with. Mars decided to change the formula to make the chocolate richer and re-introduce this new bar at Sweets and Snacks Expo 2011. These should start hitting store shelves in the next few weeks. I have to admit that I haven't had a 3 Musketeers bar in years. I've never been a huge fan, although I really did like the mint version. It seems like such a plain candy bar to me. Chocolate on top of whipped chocolate, so boring. As I've said before though, if you put a limited edition or new graphic on something, I'm going to buy it....so I couldn't resist asking for a sample of this newly redone bar from Mars. I did stop by the store on my way home from work the other night and I picked up a regular (or "old formula") 3 Musketeers bar to compare. The new formula is definitely an improvement and the chocolate and chocolate taste were much better and did have a richer feel and taste to them. The whipped nougat middle sees the most improvement and instead of a sugary burn your throat middle, I found it to be more soothing and chocolatey. I don't think the change is drastic, but I wonder if it will make the die-hard 3 Musketeers fans angry with Mars. Some people hate change, even when it is for the better. Personally, as someone that never buys one of these bars, I can now see myself picking one up on occasion to get my chocolate kick for the day. The claim that this bar has so much less fat than competitors' bar means nothing to me. I buy candy as an indulgence, so that does not matter to me. In the end this has the same number of calories as anything else, but I'm sure that lower fat appeals to some people. I think the new taste will appeal to most everyone. So, if you have skipped over 3 Musketeers for a long while, consider picking one up when the new formula hits the shelf at your local store. It's certainly worth a try! 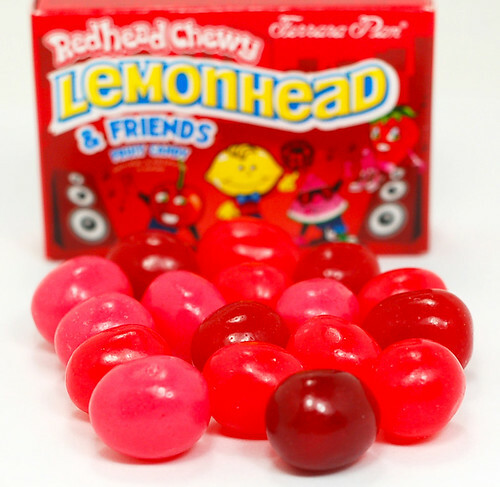 Ferrara Pan is adding another flavor to their fantastic Chewy Lemonhead & Friends line of candy. They started off with the Tropical Chewy Lemonhead & Friends, then they introduced the new Berry Chewy Lemonhead & Friends at Sweets and Snacks Expo 2010. 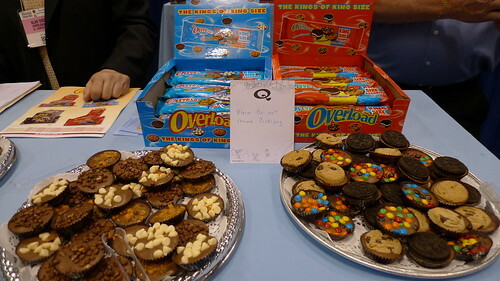 At Sweets and Snacks 2011, they introduced the Redhead Chewy Lemonhead & Friends. Personally, I think this is the best name they've come up with yet. When I read this new name, I laughed and laughed, it reminded me of the old phrase "the red-headed step-child". The addition of different flavors by color is not new among candy companies. Just Born created Mike and Ike Red Rageous! and Starburst created Fave Reds in a special packaging last year. 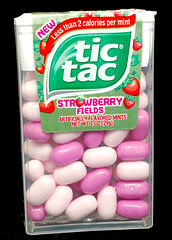 The flavors in all of these packages are almost always the same: watermelon, cherry, red raspberry and strawberry. Sometimes you'll see a fruit punch thrown into the mix, but that's not a real red fruit. This box includes watermelon, cherry, strawberry and red raspberry. I tried the watermelon first and the flavor seriously woke up my taste buds. It was VERY watermelony. I was really surprised by the taste. It was really good, but I was not expecting it to be that powerful. The strawberry was just okay.....not my favorite, but it wasn't bad. The cherry was our family favorite. It tasted like a miniature version of a cherry sourball. The taste was fantastic. The red raspberry was good and added a nice extra flavor you do not normally find in a red fruit candy mix. The chewy texture and panned exterior were great, as always in a Ferrara Pan candy. I haven't met a Chewy Lemonheads & Friends product I did not like. I like the chewy version better than the solid version, but that is a matter of personal preference. I enjoy this candy because it is not sticky and is a great size for kids and adults. I love the little $.25 boxes you can find at many stores. I think they are just the perfect size for a hit of sugar when you need one. This was an excellent new product, but I'm not sure when these will hit retail. I assume this summer, since that is normally when this type of candy makes it to market. I went for candy and ended up buying this Beef Jerky on the spot at the show (thank you amazon.com android app!). Snacks made up 40% of the show this year, so there were a lot of them to sample. I do not review snacks on this site, but I met the writer for Taquitos.net who has reviewed 4,997 snacks so far. Taquitos.net Link I did love this product and cannot wait for it to arrive. A family run company makes this product, they have many variations and they were all great. I love citrus, so this version was absolutely perfect for me and the taste was amazing. I had a great talk with the owners of the company, they are super nice people with a passion for making amazing jerky. I'm a little melancholy over the introduction of so many snacks to the show this year. Even though I found something like the product above that I loved. I think the Candy Professor felt the same way and she expresses those thoughts in this new article out today: The End of Candy: How Health Food Threatens Our Sweets. Dove had very simple, silky, classy, rich display just like their candy. I'm not sure who designed this but wow, it was a great display. 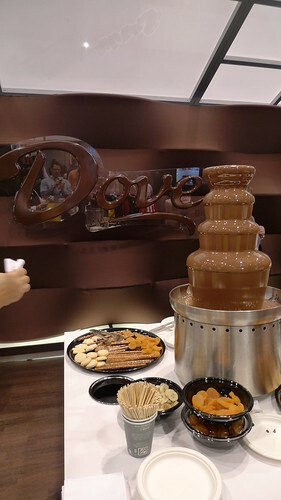 It was a great area to sit and enjoy Dove chocolate pouring out of a chocolate fountain. They had various fruit, cookies, pretzels etc... to dip into the chocolate fountain. They even had people on standby that would rush in and wipe up any spilled chocolate as soon as you were done. Fantastic display by Mars. 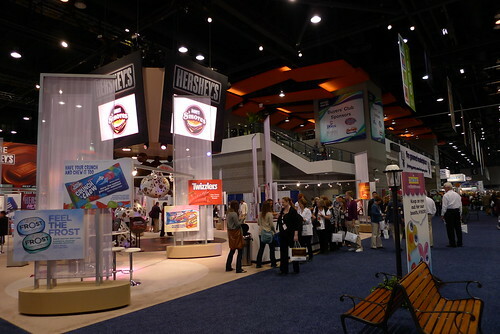 Hershey also had a great booth complete with JumboTron-like screens hanging above it. 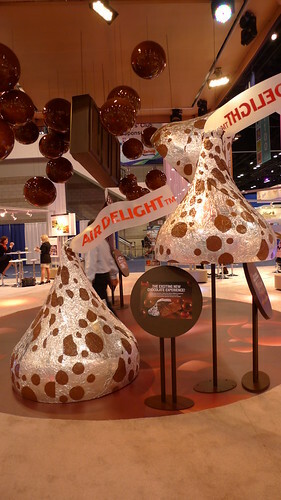 The giant Aerated Kisses were pretty cool props too. I think both booths should be expected to be nice since these are two of the largest brands in the United States. Still, they went the extra mile and created an area that really set off their products. That is not to say the smaller companies didn't have nice areas, most of them did, but these two candy giants had outstanding setups that deserve some attention and credit. I realize I have typos in my work sometimes. Sugarpressure's Executive Editor spends a lot of time correcting my work. So, it is not surprising that she was on the lookout for typos in signs, displays and candy packaging. The worst one she found (and this was not horrible in my opinion) was the Overload packaging said "Not your parents candy". Parents in this case should be "parents'". Someone should have mentioned that to them before they printed their packaging and signage. I'm still going to review their product, since I thought it was an interesting idea. I will email them about their typo too, but will be sure to proofread it first!